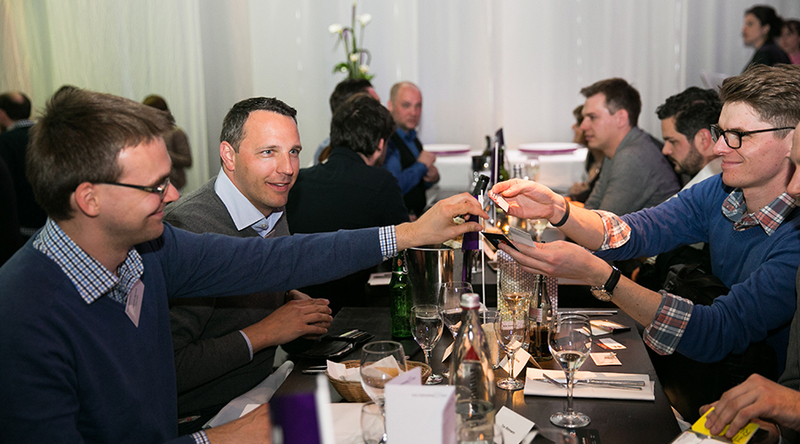 Matchmaking Dinner at International Games Week 2015 | media:net berlinbrandenburg e.V. 2015 the exclusive Matchmaking Dinner in the frame of the International Games Week took place on April 22. The games.net welcomed 180 of the most important decision-makers from the games, information, communications and technology industries as well as politics and institutions. Korea, France, Israel, Sweden…Overall 17 countries were represented at 22 tables of the Spintder & Klatt in Berlin Kreuzberg. After the opening speeches by Elmar Giglinger (Medienboard Berlin Brandenburg), Stephan Reichart (Aruba Events), Andrea Peters (media.net berlinbrandenburg) and Björn Böhning (Head of the Senate Chancellery Berlin) the guest enjoyed the dinner and changing seating constellations at each course. The selected seating arrangement enabled the right match between the conference organizers, speakers, game developers, publishers, investors and politics. At the summit of the dinner Michael Liebe (International Games Week) introduced Reine Abbas from Wixel Studios, who inspired the guests with her Dinner Speech, giving insights from the games industry in Lebanon and her work. The guest passed into the floating networking at the desert buffet: sweet delights in one hand and the business card in the other! The games.net berlinbrandenburg special thanks goes to our co-organizers at the International Games Weeks Berlin, Aruba Events, the funder Medienboard Berlin Brandenburg and our sponsors Wooga, Akamai, Berlin Partner, GD:Group, KPMG, Norton Rose Fulbright and Paymentwall.